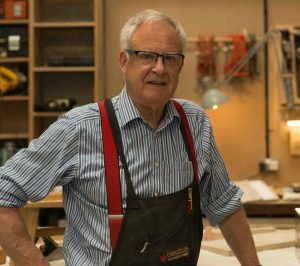 Christopher Gibbins has over 30 years of experience designing and creating furniture and fine objects. Starting life as a mechanical engineer his creative side took over and he decided to work with wood. He is fastidious about attention to detail, whether it be your cupboards or your family heirloom timepiece, creating exact, crisp and precise joinery. Christopher has a feel for what “looks” and “feels” right, is appropriate for the house, wood and intended usage. This is a skill that if impossible to teach and if you ask him how to do it the answer will be “you just sort of have to squint at it and see if it looks right”. The workshop is equipped with machinery that you would expect to find in a joinery shop, however, all the finishing is done by hand with tools passed down from his father. This gives a finish to your piece which no piece of machinery is able to achieve.